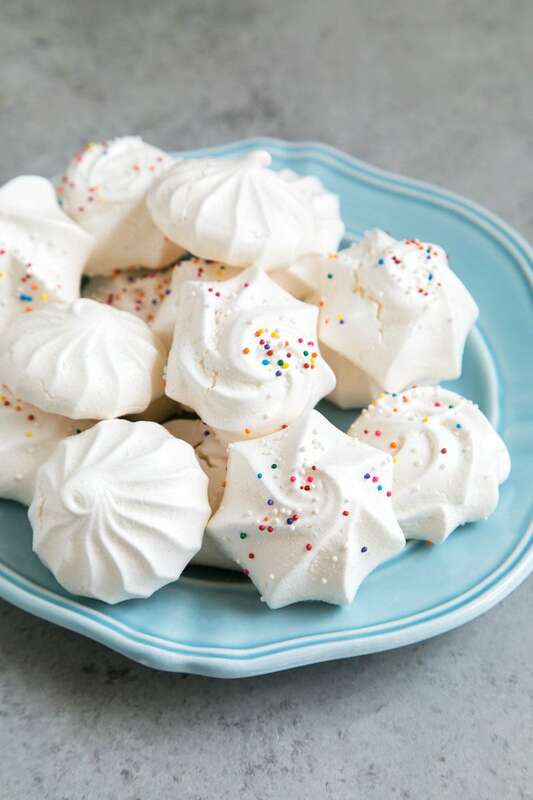 Meringue cookies are a light and crisp sweet treat. They’re easy to make and only require egg whites and sugar! 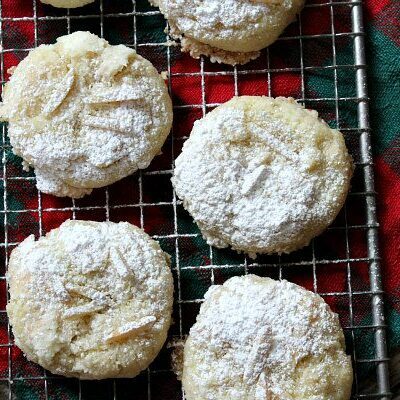 Looking for a sweet and crunchy, melt in your mouth cookie? 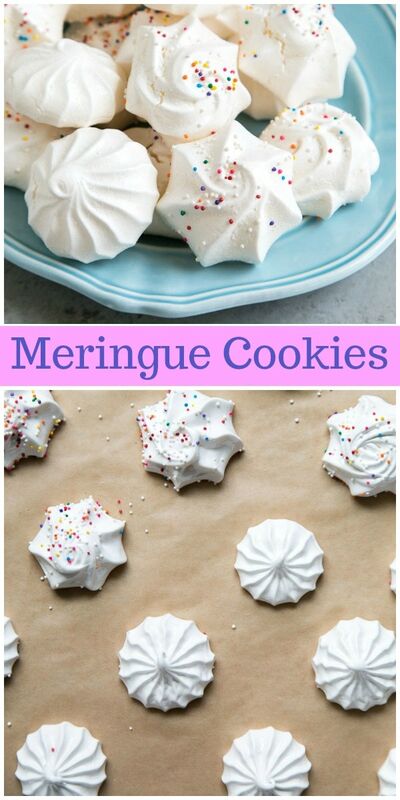 These meringue cookies are it! Meringue is simply a light and airy mixture of whipped egg whites and sugar. There are three types of meringue: French, Swiss, and Italian meringue. 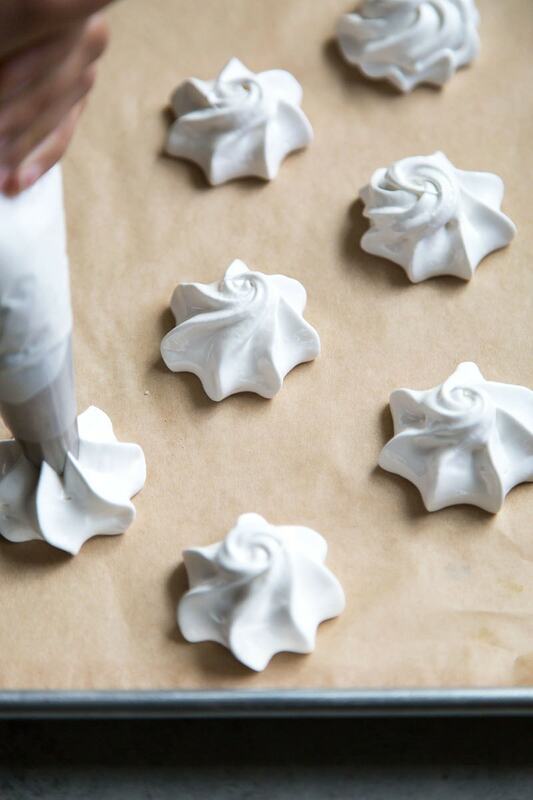 The recipe for these meringue cookies are made using French meringue. In the French meringue technique, the egg whites and sugar are beat to the desired texture without any additional heat. Swiss meringue requires egg whites and sugar to be heated over a double boiler. While Italian meringue is made by adding a hot simple syrup mixture in the whipping egg whites. It is best to use room temperature egg whites. They will whip stronger and fluffier than cold egg whites. 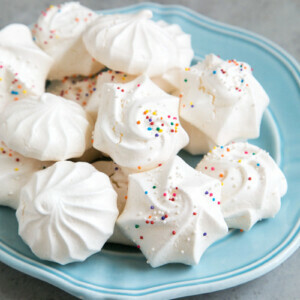 Meringue cookies can be whipped using a stand mixer or an electric hand mixer. I don’t recommend mixing these cookies by hand. It will take far too much time and effort. Ensure that your mixing bowl and whipping tools are clean. 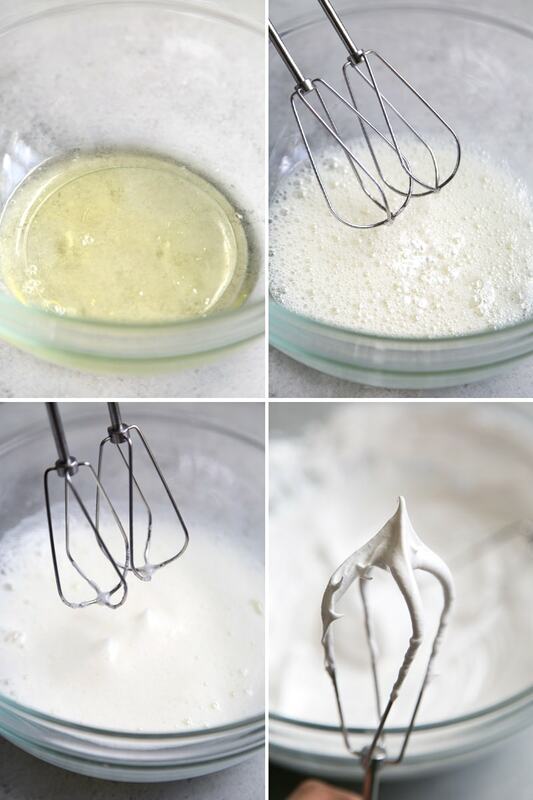 Any trace amount of fat, be it egg yolks, oil, or butter, will prevent the egg whites from whipping to stiff peaks. Start by whipping egg whites at slow speed until foamy. Then add a tiny amount of cream of tartar for extra stability. Whip to soft peaks. At this point, you can slowly add in the sugar. Once all the sugar has been added, increase to medium-high speed and beat to stiff peaks. Be patient during this process. It may take 8 to 10 minutes to achieve stiff peaks. Meringue cookies can be piped using a large star tip or large round tip. Pipe mounds, rounds, or little rosettes. Allow about 1 1/2-inches to 2-inches of space between the cookies to ensure even airflow during baking. 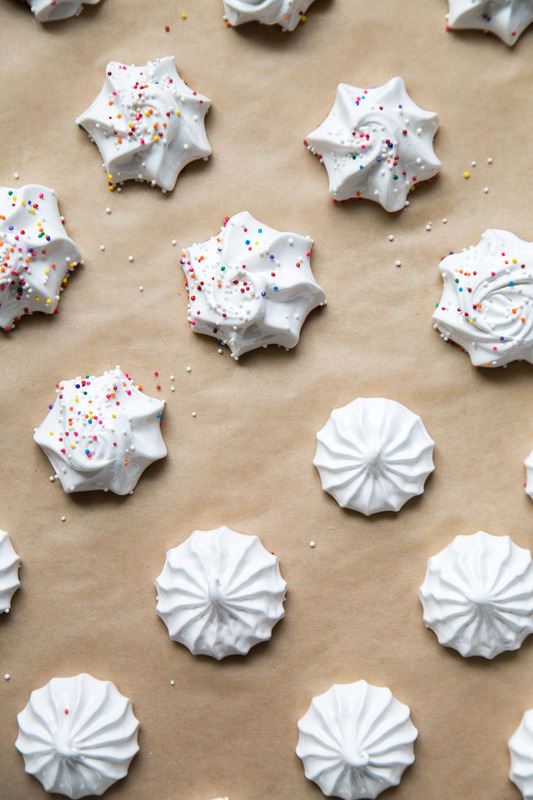 For extra crunch and color, decorate the piped meringue cookies with sprinkles before baking. These meringue cookies are flavored with vanilla extract. 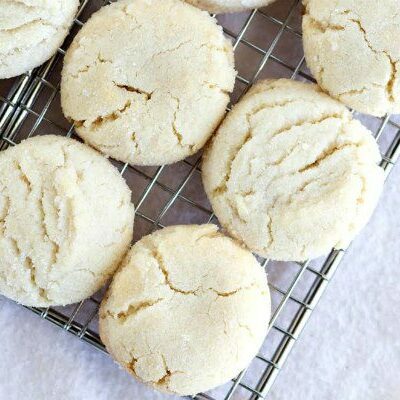 Use clear colored vanilla for stark white cookies (you can find clear vanilla extract in craft or baking supply stores). 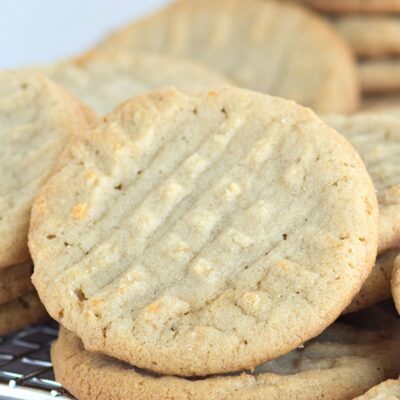 Otherwise, regular brown colored vanilla will give the cookies a slightly cream or tan hue. 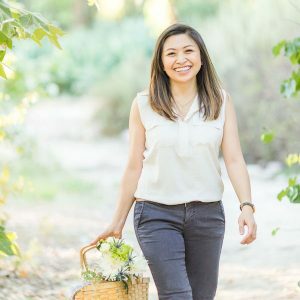 Aside from vanilla extract, almond extract or lemon extract are great alternatives. For these other flavors, I suggest adding half of the listed vanilla extract amount. For those with a major sweet tooth, dip the baked meringues in melted chocolate! If you are following the Weight Watchers Freestyle SmartPoints program, each meringue should be recorded as one point. If you’re interested in more meringue desserts, you might like this Classic Lemon Meringue Pie or Lemon Meringue Cake. These Fireworks Cookies are decorated with royal icing, which is also meringue based. 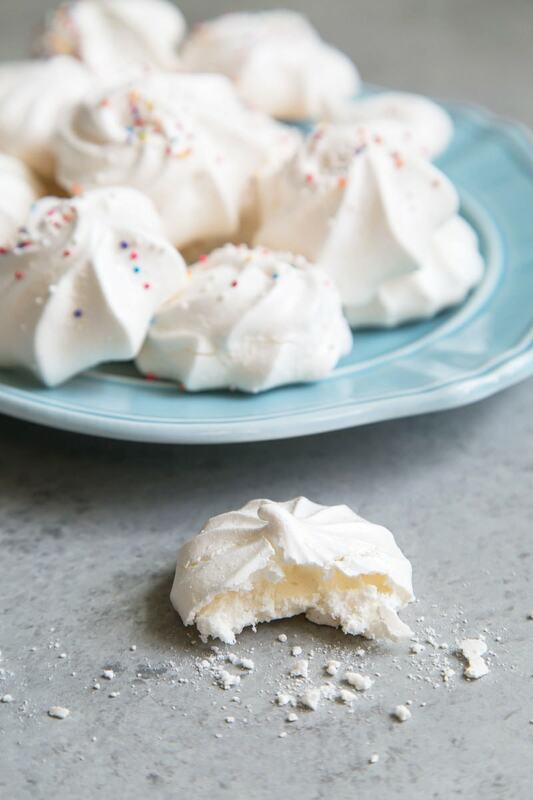 Meringue cookies are a light and crisp treat. 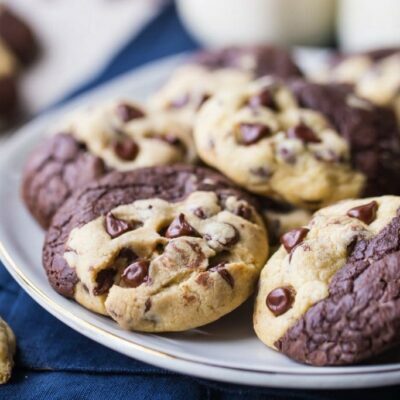 They're easy to make and fat-free! Preheat the oven to 225 degrees F. Line two baking sheets with parchment paper or silicone baking mats. Set aside. In the bowl of a stand mixer fitted with a whisk attachment (or using an electric hand mixer), beat the egg whites at low speed until foamy. Add the cream of tartar. Continue to beat at low speed until soft peaks form. Increase to medium speed while adding the sugar 1 to 2 tablespoons at a time, allowing the sugar to dissolve before adding more sugar. Once all the sugar has been added, increase to medium-high speed. Whip to glossy, stiff peaks, about 6 to 8 minutes. Add in the salt and vanilla extract. Mix until incorporated. Fit a pastry bag with a large star tip (or desired piping tip). Fill the pastry bag with the meringue. Pipe 1 1/2-inch to 2-inch diameter cookie mounds about 2-inches apart on the prepared baking sheets. If desired, add sprinkles on top. Bake for 1 hour. Turn off oven (don't open it). Let the meringue cookies remain in the oven for another 30 minutes. Slightly open the oven door and use a wooden spoon to keep the door ajar. Let the cookies rest in the oven for another 30 minutes, until they have cooled to room temperature. Meringue cookies should be dry and crispy on the outside. Peel the meringue cookies from the parchment paper or silicone mt. Store at room temperature in an airtight container. Room temperature egg whites will whip stronger and fluffier than cold egg whites. Ensure mixing bowl and whisk (beaters) are clean. Any trace of fat (be it egg yolks, oil, or butter) will prevent the egg whites from forming stiff peaks.